In automated systems, sensors and actuators must interact with one another functionally and safely. The necessary coordination is performed by the MSI 100 programmable Safety Controller. The controller monitors all safety functions, e.g. of E-STOP buttons, two-hand controls, protective doors, AOPDs and similar, in machines and systems in extremely compact form. With an overall width of just 67.5 mm, the device makes 20 safe inputs and 4 safe outputs available to the user. Additional clock- and ground-switching outputs increase the safety of the monitoring circuits. Message outputs are available for diagnostics. The programming for defining the device function can be quickly and easily performed with the MSIsafesoft software. The software’s certified function blocks, which can be integrated using drag & drop functionality, facilitate menu-driven and trouble-free configuration of every safety circuit. 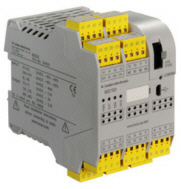 Purchase your Leuze MSI 100 Programmable Safety Controllers today!